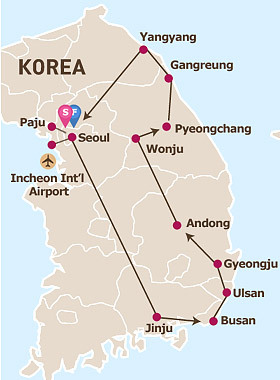 Eastern and Cultural Korea in 9 Days Value Tour. History and gorgeous scenery in the eastern districts of Korea are the highlights of the Eastern Korea section of this package. South Korea eastern cities boast a thousand years of rich history, including Gyeongju city, where you can find many UNESCO World Heritage sites. In addition, you can experience a hiking course through the most famous mountain in Korea, Seoraksan. The old and new Korea are juxtaposed in an itinerary that combines the sophisticated excitement of Seoul with the fascinating remains of Korea’s ancient past in Gyeongju. Between the two, you'll visit the DMZ, the demarcation between North and South Korea and the most heavily armed border in the world. After breakfast, meet up with the guide at hotel lobby. Visit Gwanghwamun Gate, the main gate founded by the first king of the Joseon Dynasty. Next, explore Gyeongbok Palace (Changdeok Palace on Tuesday), arguably the most beautiful and the grandest of all five palaces. Then pass by The Blue House, also called Cheong Wa Dae, the presidential residence. For the next stop, head to Myeongdong, one of the busiest places in Seoul and among Korea's premier shopping destinations. Then explore Namsangol Hanok Village (Bukchon Hanok Village or Insadong on Tuesday) where there are five restored traditional Korean houses and a pavilion, a pond and a time capsule. Next, visit North Seoul Tower, offering panoramic views of Seoul and the surrounding areas. Stop by a duty free shop and transfer to hotel. After breakfast, visit Andong Hahoe Village, home to descendants of the Ryu clan of Pungsan and well-known for its traditional houses. Next, visit Hanji Theme Park where you can get a chance to experience the Hanji making process. Transfer to Pyeongchang and check in hotel. Lunch and dinner will be served en route at local restaurants. After breakfast, visit Jumunjin Seafood Market, including a variety of fresh seafood caught on the East Coast. For the next stop, transfer to Yangyang for a short hiking at Jujeongol of Mt. Seorak to enjoy the nature. Transfer to Seoul. After breakfast, meet tour guide at your hotel lobby between 7:30am to 8:30am. The first stop will be Imjingak Peace Park, which established in 1972 for remind the Korean War and wish for peace in entire Korea. Next, visit The 3rd Infiltration Tunnel, discovered on Oct.17, 1978 and located 52km from Seoul. Then, Dorasan Observatory where North Korean military personnel are visible and so are the highlights of Gaeseong and the Geumgangsan Diamond Mountains. Then stop by Dorasan Station, a railway station on the Gyeongi Line, the northernmost stop on South Korea’s railway line and Unification Village. After the tour, enjoy the Lunch at a local restaurant. Also, stop by the shopping center and transfer to hotel around 16:00. After breakfast, meet tour guide at hotel lobby. Visit Hwaseong Fortress in Suwon. Hwaseong Fortress is the official fortress of Suwon-si, Gyeonggi-do, from the latter days of the Joseon Period (1392-1910). The fortress wall is 5.52km long and it has a great variety of military facilities you cannot find at other fortress. After the tour, enjoy Lunch at alocal restaurant. Next, visit Korean Folk Village which you can see Traditional Houses, Farmers Music/Dance and Acrobatics on a Tightrope. Stop by Amethyst/Ginseng Centre and transfer to hotel. US$ 1695 per person- based on 2 sharing a room and airport transfers.